Local law enforcement agencies respond to NYC explosion. Pete Suratos reports. An explosion rocked an underground passageway in New York City Monday morning, prompting mass evacuations but appearing to only seriously injure the man who detonated the apparent improvised explosive device. Bay Area transit agencies are monitoring the situation, but most are not making any significant security changes. BART has instructed its officers to "maintain a high level of visibility and awareness," according to the transit agency. There is no threat to the Santa Clara Valley Transportation Authority, but the agency indicated it has beefed up patrols, which it notes is a "standard protocol in these circumstances." The move is "purely precautionary," according to a spokesperson. The San Francisco Municipal Transportation Authority, which operates MUNI, is coordinating with the city's police department to "determine appropriate deployment strategies," according to a spokesperson. 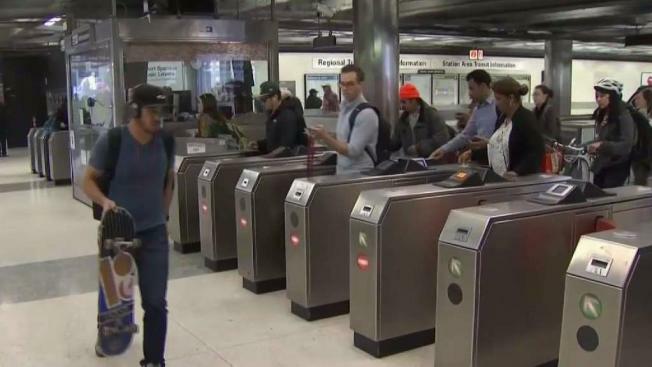 The San Francisco Police Department later indicated that there are no known threats to the city, but increased patrols will take place at tourist destinations across the city and across transit systems. The Golden Gate Bridge, Highway and Transportation District indicated it will not be implementing any elevated security measures. "Our security level is always high and is not being changed this morning," according to a spokesperson's statement. Caltrain, which does not typically share security plans with the public, does not appear to be implementing any changes, according to a spokesperson. AC Transit in the East Bay will also keep its same level of security, according to the agency.